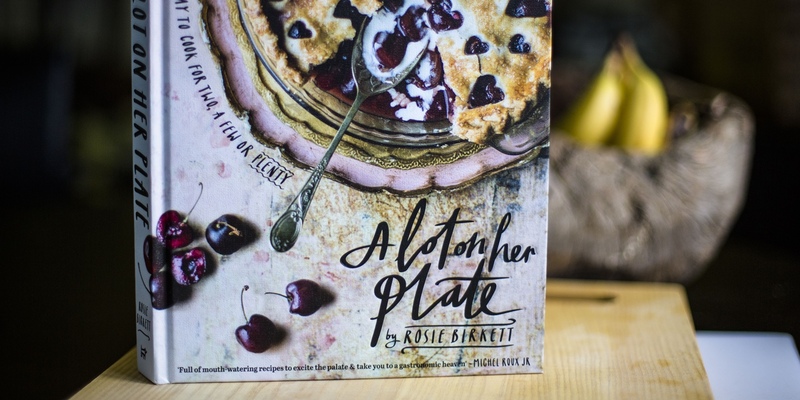 Rosie Birkett is a London-based food writer and her first book takes its name from her increasingly popular blog of the same name, offering recipes inspired by family, friends and her love of food. Rosie Birkett is a London-based food writer/stylist and the book takes its name from her increasingly popular blog of the same name. She states “we eat to live, but, when we can, there’s nothing better than living to eat”. Rosie gives a detailed introduction of her journey with food explaining her influences from around the world, specifically India, Vancouver and Mexico, and gives the reader a basic understanding of the best way to shop for produce, kitchen equipment and store cupboard essentials. Breakfast and brunch begins with a cod’s roe and sweetcorn fritters recipe which seems a little odd until Rosie justifies that she is not a morning person and needs the chilli to wake her up! Some of the breakfasts are staples such as granola and pancakes but many are Mexican- or Indian-based, making a refreshing change for the first meal of the day. Starters are seafood focussed, which Rosie cites back to her trips to the seaside as a child with her family; Dad’s seafood sizzle is an easy to prepare shellfish mix, while octopus carpaccio is much more challenging, adventurous and time consuming, but definitely worth the wait. Every dish has its own story, and many reference culinary friends she has made along the way, the Indian restaurant Dishoom being a favourite. This gives the reader an insight into what Rosie likes to eat as well as what she likes to cook. There are strong Italian influences in the main courses, risotto, squid ink pasta, porchetta and polenta all make mouth-watering appearances, along with ingredients such as 'nduja, Gorgonzola and raddichio. Rosie also champions the use of lesser known (and inevitably) cheaper cuts of meat. Feasts for friends are comforting dishes covering both hot and cooler weathers and are easily adaptable from 2 to 20 guests. Alongside favourite salads such as panzanella and fig and Gorgonzola, Rosie gives us some more exciting and unusual combinations, like a shredded sprout salad with a buttermilk and Jalapeno dressing, and a warm salad of roasted aubergine and broccoli with an anchovy and lemon dressing. Family influences remain strong with Mum’s seafood orzo salad. Desserts are clearly close to Rosie’s heart as the recipes really shine in this section, every dish looks and sounds delicious with the lychee and hazelnut pavlova, and the blueberry, basil and almond pudding pie being particular favourites. The only criticism for this section would be that it isn’t long enough! Essentials are a mix of things that “add a bit of ‘wow’ to your cooking arsenal” and include everything from preserved lemons and siracha mayonnaise, to cumin brioche. A welcome addition to the standard essential chicken stock/custard/vinaigrette of many cookbooks. A lot on her plate really gives us an insight into Rosie’s personality and style. There is something for every possible mood, season and level of cook; this book really succeeds in making the reader want to grab the phone, invite some friends over, and get stuck in in the kitchen.